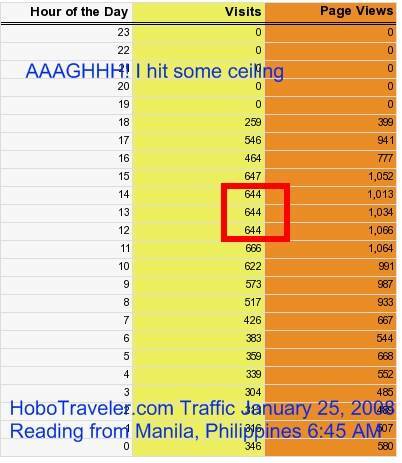 HoboTraveler.com traffic continually slowed while I was in West Africa for seven months. I have now increased traffic by about 120 percent from the time I arrived back in Thailand. There is a Fox in the Hen House, today I saw the Fox. I am have captured my computer screen of what I see as being impossible to randomly happen with the traffic of an internet site. Thailand and the Philippines has some of the best cheap country internet on the planet. I am in these countries to do maintenance on the sites and prepare for even more traffic. The number of variables is staggering to what are problems and solutions needed to implement. Here is the Fox in the Hen House. How is it possible for three hours in a row, HoboTraveler.com has 644 unique visitors exactly on the site? 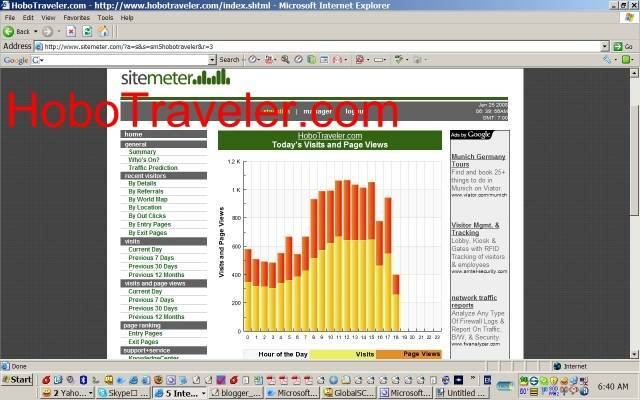 FLAT line Bar of site traffic. I looked at this statistic and thought. There is some ceiling, throttle on something, something is really screwed. There is are many ways this can happen, and what makes me frustrated is this, I just work hard, do my best. We have a dedicated server, we or I am continually told there is no limits to the traffic, the site will just go slower and slower. It is also possible site meter the little box guy at the bottom of all pages has a ceiling. Note, I have shut off the ability to comment because I am tired of hearing from all the crazy nuts who travel in Thailand and Philippines.